Here at gThankYou! in lovely Madison, Wisconsin, we think there’s no more enjoyable and tasty way to beat July’s summer heat than with a cool, creamy treat. And there’s no better time to do it, either. July is National Ice Cream Month, a designation launched in 1984 by the late former President Ronald Reagan, who was famous for more than his style of populace politics and love of Jelly Beans. According to the International Dairy Food Association, more than 90 percent of people in the U.S. enjoy ice cream: The industry generates more than $21 billion in annual sales and provides jobs for thousands. About 9 percent of all the milk produced by U.S. dairy farmers is used to produce ice cream. Wow. So, what are the hottest ice cream flavor trends this year? It might not come as a surprise, but flavor-wise, vanilla continues to reign as the top choice among U.S. ice cream eaters, topping sales in both grocery stores and restaurants, says the IDFA . Why? This flavor is the most versatile, mixing well with toppings, drinks and bakery desserts. Surprised? Not us. Data in the NPD Group’s National Eating Trends In-Home Database says the most popular ice cream flavors are: Vanilla (27.8 percent), chocolate (14.3 percent) and strawberry (3.3 percent). So what’s your favorite ice cream flavor, is it weird or not-so-strange? And, tell us what you think about these new less than traditional flavors below. Happy licking everyone! gThankYou, LLC is based in Madison, WI and produces America’s favorite meaningful, affordable and convenient employee gifts. gThankYou!® Certificates of Gratitude™ are one way savvy companies demonstrate commitment to valued employees and customers. The company is best known for its Turkey Gift Certificates, Ham Gift Certificates, and Grocery Gift Cards. Other Favorites include our Ice Cream and Pie Gift Certificates. Those in the business of Thanks rarely get a chance to see it in action first-hand. But that’s what happened recently when gThankYou was among a select group of professional gift pros highlighted in a story in the October Business Beat Magazine. The feature in the publication of the Greater Madison Chamber of Commerce explores the wide array of opportunities for giving professional gifts, noting that many firms choose to recognize employee accomplishments and occasions. That convenience and meaning allows gThankYou certificates convey appreciation in a way that builds relationships and engages employees. It’s a rare treat for us to have such an “aw, shucks” moment. But having our work highlighted in this way gives us a glimpse of the appreciation that comes through recognition. Sort of a validation that what we’re doing really works. It certainly has given us a boost to work even harder to spread Thanks around. What’s better than a triple scoop cone on a hot summer day? A free enclosure card from gThankYou that says “Thanks for a job well done!”. Corporate America’s favorite employee gift source is pleased to offer four new free enclosure cards this summer to help make workplace gift giving more personal and simple. Sizzling BBQ Grill and an a collage of Favorite Summertime Activities. All gThankYou Enclosure Cards are displayed on the company’s website. Each design was developed by artist Amy Pierquet of Waterfront Graphic Design. “There’s nothing more fun to eat than ice cream, and nothing that makes for a better celebration,” says gThankYou President Rick Kiley of the new card options sure to make anyone smile. They’re the perfect compliment to our new Ice Cream Gift Certificates. more convenient and meaningful. Add a custom message and your company logo to personalize your gift, and make it more special. A popular choice for employee recognition and reward programs, and end-of-quarter employee gifts, gThankYou Gift Certificates give employers the ease of selecting new Ice Cream, Turkey, Ham or Grocery Gift Cards in a variety of denominations. Employees have the convenience of deciding the type of Ice Cream, Turkey or Ham they want by redeeming gThankYou! Gift Certificates at any grocery store. About gThankYou.com. gThankYou® Certificates of Gratitude™ are an ideal employee gift. Turkey Gift Certificates, Ham Gift Certificates, Ice Cream Certificates and Grocery Gift Certificates are favorites because they are fun, meaningful, affordable and appreciated by all. 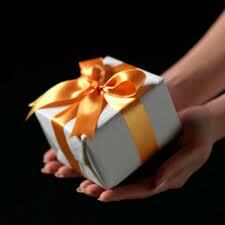 Convenience is the top reason companies choose gThankYou Gift Certificates. gThankYou Certificates can be ordered quickly online or by telephone, are easy to distribute to employees, and can be redeemed at virtually any grocery stores for the ice cream, turkey, ham or groceries that employees choose. 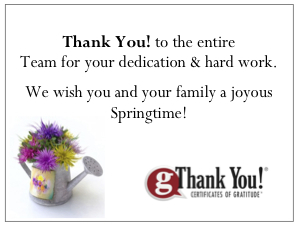 gThankYou Gift Certificates create a perfect opportunity for workplace leaders to recognize success. gThankYou, LLC (http://www.gthankyou.com ) is based in Madison, Wisconsin. Find out more about gThankYou on the company’s website. And read more about how Thanks can boost your company at the gThankYou Blog. 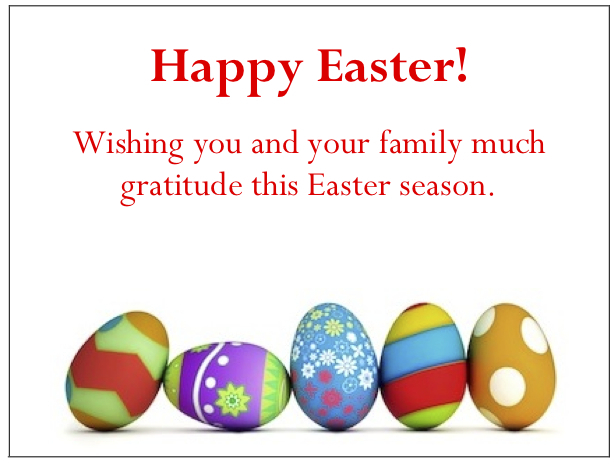 Contact: Rick Kiley, President, gThankYou, LLC, info@gthankyou.com, 888-484-1658. Certificates of Gratitude™ is a trademark and “gThankYou” is a registered trademark of gThankYou, LLC. We’re big fans of Ice Cream Sundaes, as well as lists. So it was great fun pouring over some lists of the top Ice Cream Sundaes. The Ice Cream Sundae remains among the most simple, yet elegant desserts. But one thing is certain: there’s no end to what you can create using ice cream, toppings and your imagination. Michel’s Frozen Custard in Madison, WI, once offered the Viva Las Vegas Sundae (available now only by request) featuring vanilla custard topped with creamy peanut butter (a la Elvis), hot fudge and banana slices. Grown ups and kids with advanced palates will enjoy the Tiramasu Sundae posted in the Augusta Chronicle from “Sundaes & Splits: Delicious Recipes For Ice Cream Treats,” by Hannah Miles. It uses homemade mascarpone ice cream with from-scratch syrup. Blue Bunny Ice Cream has a recipe for the Cinnamon Bun Hot Apple Sundae posted in the Chatanooga Times Free Press. Think of a gooey, halved cinnamon roll with vanilla ice cream, glazed walnuts, apple pie filling and butterscotch-caramel topping. 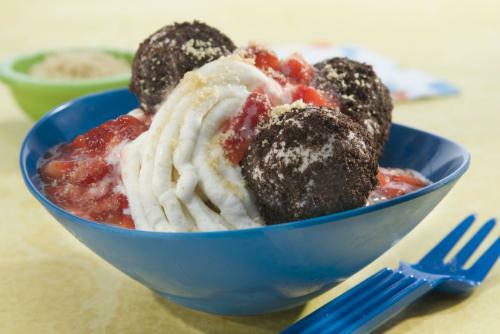 Breyers Ice Cream and chef Gale Gand have created a Spaghetti & Meatballs Sundae with rocky road “meatballs”, sauce made of mashed strawberries and vanille ice cream extruded through a potato ricer to become noodles. Think you make the Best Ice Cream Sundae? Now, you can prove it. Breyer’s is searching for the next best treat in its Sundae Scoop-Off Contest. Submit family-friendly entries containing 10 or fewer ingredients through September 13. The winner gets $10,000, a trip to Chicago and a private cooking lesson with Gale Gand. And don’t be shy about sharing your favorite, and best, Sundae picks here. We don’t want to start any arguments or anything, but an informal poll of ice cream lovers here has revealed that, hands down, the Best Ice Cream Dessert is (drum roll please…) Ice Cream Cake! It appears that 2010 has unofficially been declared the year of the Ice Cream Cake as more and more specialty ice cream shops and national chains offer their own versions. 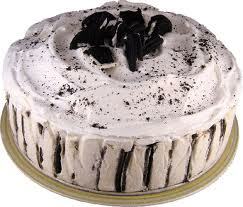 Nothing draws guests to a party than the mention of Ice Cream Cake on the invitation – a proven phenomenon. The great go-togethers pair very well combined in a frozen treat. eHow’s How to Make an Ice Cream Cake. Real Simple Recipes’ Ice Cream Cake. Rachel Ray’s Triple Chocolate Ice Cream Cake. Nigela Lawson’s Ice Cream Cake courtesy of Food Network. Martha Stewart’s Strawberry and Pistachio Ice Cream Cake. Several sources say the idea for ice cream cake came from the trifle, an elegant dessert made by layering cream and cookies or cake in a big, glass serving bowl called (what else?) a trifle bowl. Seems anything goes with today’s Ice Cream Cakes. What’s your favorite Ice Cream Cake, or nomination for the Best Ice Cream Dessert ever? We’re halfway through July and would be remiss if we didn’t mention that this month is National Ice Cream Month! 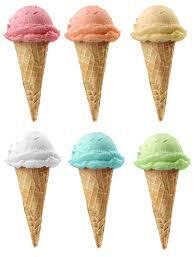 In fact, this Sunday, July 18, is National Ice Cream Day. It’s apt to point out the many ways to celebrate everyone’s favorite frozen treat. As the story goes, former President Ronald Reagan in 1984 named July National Ice Cream Month and the third Sunday in July National Ice Cream Day. In true populist fashion, he proclaimed the celebration pointing out that a full 90% of Americans love ice cream. Sounds about right. The World Dairy Diary Blog recently featured the dessert by self-proclaimed Grillmaster Rick Browne. It’s a version of Baked Alaska you can make on the grill. (Is there anything you can’t prepare on the grill?) Check out the video and try making it yourself. Or, check locally to find ice cream festivities where you live this weekend. Scope out freebies, like these at Buffalo’s Perry’s shops. Go for some artisanal treats. Because we in the U.S. eat more ice cream per person than any other country, every town and city has its own special scoop shop, with specially made Ice Cream, like these in Minneapolis. Play Ice Cream Trivia while enjoying your favorite dish or cone. The Great Falls Tribune has posted a good bit of history to get you started. Remember, you have the whole of the month to celebrate. How will you mark this cool occasion? Biden’s mistake illustrates a really good point. Most people don’t know the difference. That strikes me as somewhat odd, because I sense most do grasp the difference between ice cream and other frozen treats like, for example, sherbet or granita. Let’s start with the misunderstood frozen custard. It’s not soft serve ice cream. But it is unmistakable from any other type of ice cream once in your mouth and belly. It’s much richer than ice cream, made with egg yolks in addition to cream and sugar and contains more milk fat. Its extra creaminess also comes from a different churning process. So, there you have it. Custard is denser and richer than ice cream or other frozen treats. 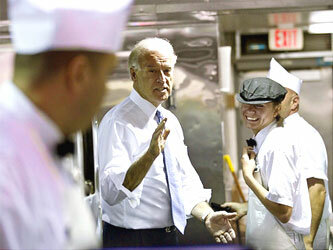 Perhaps the White House staff can bone up on regional culinary specialties next time Biden travels, lest they want to endure another classic Biden blunder. What’s the most unusual thing you’ve eaten on top of your ice cream? How about buttered popcorn? It’s perhaps the oddest on this list of weird ice cream toppings. The best thing about ice cream is the countless ways there are to serve it. It’s the ultimate customizable treat with toppings, mix-ins and variations to please everyone. But what’s the top ice cream topping? According to WiseGeek, hot fudge, caramel and butterscotch sauces are the most popular, with strawberry sauce and maple syrup following. My favorite, particularly with a bowl of quality vanilla, is homemade rhubarb sauce. There’s so much more than sauce, categorized like this: fruits, candies, nuts and other fun other stuff — think sprinkles and whipped cream. If you need new topping ideas find them on Suite101. And if you like from-scratch, try this recipe for toffee sauce from ice-cream-recipes.com. Add texture with this Graham Cracker Crunch topping recipe from All Recipes. Then, if you’re up for a fun challenge, try this trivia game on Sporcle where you can guess the Top 10 Ice Cream toppings. I scored a six. And buttered popcorn was not on this list.